West of the Moon ATA held its second rank testing of 2013. Over 80 students tested for rank, making this one their largest testings to-date. OSWEGO, Ill. - April 2, 2013 - PRLog -- Every ten weeks, the students at West of the Moon are given the opportunity to test for their next rank. Students are scored in three areas: form, one-step/freestyle sparring, and board breaking. Beginner students (first three ranks) are scored on self-defense in lieu of board breaking. “One thing we emphasize to our students is that this is a test, there are no guarantees,” school owner Nick Zorn said. Students are expected to attend a minimum of eighteen classes over the ten week period in order to be considered for rank testing. West of the Moon holds classes six days a week and it is recommended that students attend class at least twice each week. One student, Adam Whepley, tested for the rank of first-degree black belt decided at the testing this past weekend. As a black belt candidate, Whepley was required to run a mile prior to his testing. Several of his peers and even his mom joined him as he braved the 28 degree cold Saturday morning. Whelpey completed the run successfully and had a big smile on his face when he returned to the school. The first group to test was the “Tiny Tigers.” This group consisted of students between the ages of four and seven. Mr. Zorn led the Tiny Tigers through their form, one-steps and with the help of the floor judges, the Tiny Tigers were “attacked” and they demonstrated their weak-link release self-defense. After an efficient one-hour testing, the Tiny Tigers received their new rank and were dismissed. The second group to test was all junior and adult students through the rank of green belt. Mr. Zorn joined chief instructor Charlotte Kennerly and guest judge Cherie Miller in scoring students from this group. Students were brought up in small groups and demonstrated the material they’d learned in class. As with the Tiny Tiger group before, this second testing group rank extremely efficiently and actually finished twenty minutes early. 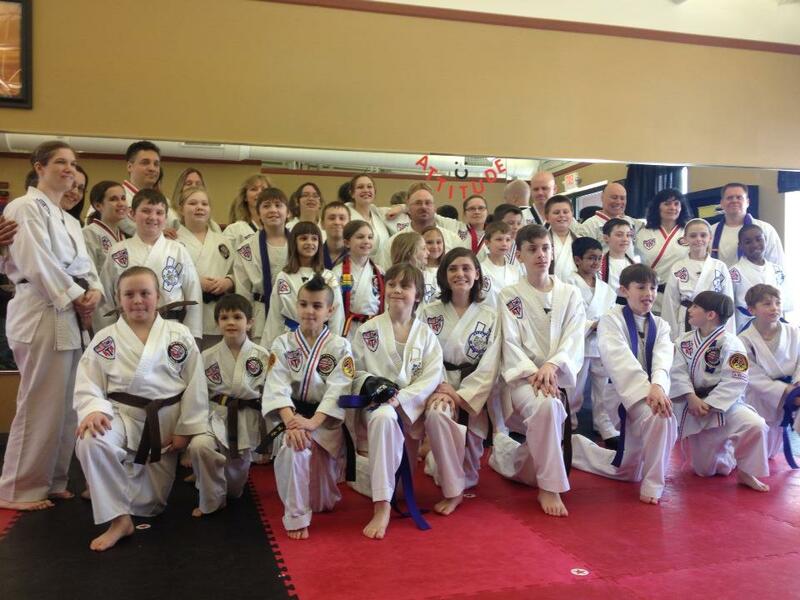 The last group to test was all of the high-ranking color belt and black belt students. Before the testing even began, Mr. Zorn told everyone that he would do a push-up for every minute the testing ran over the two-hour time budgeted. Joining the judging panel was Estela Streacker, the school owner of Journey Taekwondo in Plainfield. Two of Streacker’s students were also present to do a make-up test. Students were brought up in groups by rank and asked to demonstrate their material. The last group to perform their material was the back belts. After demonstrating the three forms he was required, Adam Whepley was asked to do them all over, back-to-back. “Adam’s face was brought red when he was done. You could tell that he was putting everything he had into those forms,” Zorn said. After sparring other students, Mr. Zorn put his sparring gear on and sparred Adam. Everyone in the school was chanting “Adam! Adam! Adam!” when he was sparring. “It was great to see the entire school throwing their support behind Adam,” Zorn said. The final part of the high-rank testing was board breaking. Two board breaking groups were run, and students took turns setting their boards up and breaking them. The intermediate color belt group broke using a backfist and the advanced color belts broke using a spin-hook kick. The black belts broke multiple boards using both hand and foot techniques. When Adam came up to break, it took him three tries to break his spin-hook kick. On his final attempt, everyone started chanting “Adam! Adam! Adam” again, and the entire school erupted in cheers and applause when he broke his boards. At the conclusion of the testing, the students that passed were presented with their next rank. A special award was given to student Triston Green for attending a record 56 classes during this past testing cycle. West of the Moon ATA started its next session on Monday (March 25th). New and returning students are welcome anytime, but the next few weeks are the ideal time to start training this session. Returning students should show up approximately fifteen minutes before taking their first class to restart their membership, and new students should call Mr. Zorn to schedule their first class at 630-554-3009 or e-mail him at n.zorn@myataschool.com.